Click here for our full short print variations guide. Click here for a visual checklist. Odd numbers come from specially marked 72-card Target hanger boxes. Even numbers come from Walmart hanger boxes. Check out our detailed guide here. Get details on the 2012 Topps Football Game Time Giveaway program. Featuring 10 total redemption cards. Each card awards an autographed football from Andrew Luck or Robert Griffin III. 1 card entitles the owner to their own 2013 Topps Football card. Featuring redemption cards that can be redeemed at local hobby shops for an exclusive set in packs of 5. Autograph versions, NFL Legends and top rookies are randomly inserted as well as a special Golden Ticket that unlocks all the autographs in the set. Packs must be redeemed from September 5th - 11th. According to 2012 Topps Football, it is the year of the quarterback. With an ambitious mix of autographs, inserts and metal-infused cards, the Quarterback Immortals program celebrates one of the most collectible positions in all of sports. It also anchors a loaded flagship set that offers plenty for all types of collectors. The 2012 Topps Football base set has 440 cards, including 110 rookie cards. Among the many parallels sets are new pink-bordered Breast Cancer Awareness cards (similar to those given away at games in 2011) and camouflage-bordered Military cards. For the first time in several years, the base design differs from the flagship Topps baseball set. 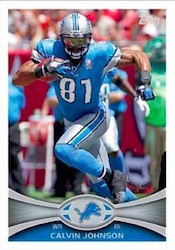 This gives 2012 Topps Football a fresh feel. Click here for details on the 2012 Topps Football Game Time Giveaway. First-year players like Robert Griffin III and Andrew Luck are featured in numerous autograph and relic inserts. Leading them are the popular Rookie Premiere Autographs. Besides single autographs, Rookie Premiere Autographs also come with dual and quad versions. 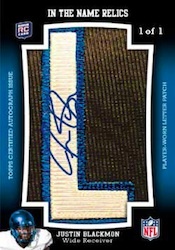 In the Name Rookie Autograph Relics come with letters from the back of jerseys worn at the Rookie Premiere. The 1965 Topps Football and 1984 Topps Football designs return for a pair of rookie throwback autograph sets. 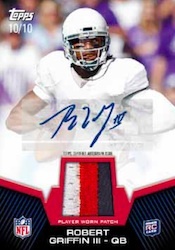 The 2012 Topps Football Quarterback Immortals line features a variety of manufactured relics. These include military-style medals, coins, bronze portraits, embedded film strips, coins and mini trophies. Of course, there are also lots of game-used pieces. 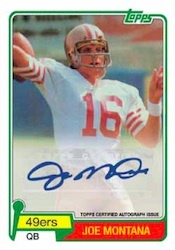 Rookie Reprint Autographs come from such all-time greats as Joe Montana, Bart Starr, John Elway, Joe Namath, Steve Young, Warren Moon and Roger Staubach. Other highlights in 2012 Topps Football include 1965 Topps Minis, player sketch cards, Paramount Pairs inserts, and Prolific Playmakers, a 50-card insert set that highlights great action photography. 2012 Topps Football comes with a 440-card base set that includes 263 veterans, 110 rookie cards, team cards, All-Pro cards and group shots from both the NFL Rookie Premiere and Super Bowl. Click here for complete 2012 variation short prints details and images. Base set parallels: Gold (#/2012), Black (#/57), pink Breast Cancer Awareness (#/399), camouflage Military (#/399), Printing Plates and Platinum (1/1). Quarterback Immortals focuses solely on the game's best passer, past and present. Includes autographs, memorabilia and insert cards. Complete details are below. 1965 Topps Mini Cards (141 cards) take the classic design and use non-action shots. NFL Player Sketch Autographs mix original art and signatures from the depicted stars. Jumbo boxes promise an exclusive Rookie Patch Card. 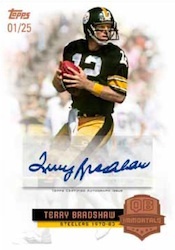 Quarterback Rookie Reprints (30 cards) bring back some of the most iconic first-year cards of all-time. Paramount Pairs (25 cards) combine veterans, rookies and legends that have something in common. Prolific Playmakers (50 cards) emphasize action photographs. 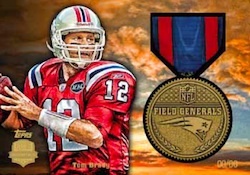 NFL Field Generals (up to 20 cards, #/50) include military-style medals embedded within them. Parallel: Autographs (1/1). Game-Winning Drives (up to 30 cards, #/10) have embedded film strips from memorable down-field pushes. 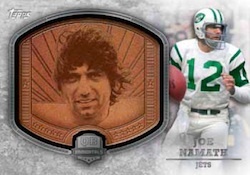 Quarterback Plaques (up to 30 cards, #/50) have bronze portraits encased in them. 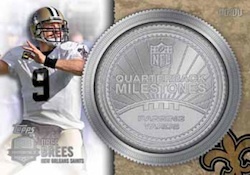 Quarterback Milestones (up to 50 cards) display a double-sided coin that notes career marks in passing yards, touchdowns and victories. Versions: Bronze (#/50), Silver (#/25), Gold (#/10) and Gold Autograph (1/1). A mini MVP trophy is included on each NFL MVPs (up to 26 cards, #/50) card. Parallel: Autographs (1/1). Super Bowl MVPs (up to 25 cards, #/46) celebrate the QBs who have led their squads to Super Bowl glory with die-cut Super Bowl MVP trophy. Parallel: Autograph (1/1). 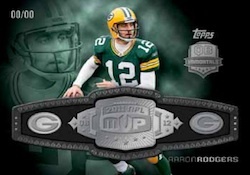 Honoring Aaron Rodgers' tremendous 2011 season, Rodgers NFL MVP Belt (#/99) features a commemorative title belt. Quarterback Immortals Autographs (up to 30 cards, #/25). Parallels: Silver (#/15), Gold (#/10), Platinum (1/1). Quarterback Immortals Relics (#/50) have game-used jersey swatches. Quarterback Immortals kicks off as a basic insert set with up to 30 cards. 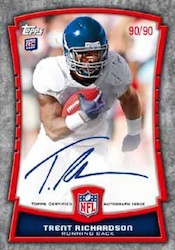 Rookie Premiere Autographs (up to 35 cards, #/90) feature on-card signatures from the 2012 NFL rookie class. Parallel: Red Ink (#/10). Rookie Premiere Dual Autographs (five cards, #/25). Parallel: Red Ink (#/5). Rookie Premiere Quad Autograph (one card, #/10). Autographed Rookie Card Variations have on-card signatures. Rookie Autographed Patch (up to 35 cards, #/10). Rookie Autographed Jumbo Patch Cards (up to 35 cards, #/5). Quarterback Rookie Reprint Autographs (#/25). 1984 Topps Rookie Autograph Cards (up to 35 cards, #/100) take the design of the iconic 80s set and combine 2012 rookies and on-card signatures. 1965 Topps Rookie Autographs use the retro-style to offer signatures from several of the top NFL prospects. Paramount Pairs Autographs (up to 20 cards, #/25). Prolific Playmakers Autographed Relics (up to 15 cards, #/50). Prolific Playmakers Autographed Patches (up to 15 cards, 1/1). In the Name Rookie Autograph Relics (1/1) have the letters and backing from an NFL Rookie Premiere player's jersey. Quarterback Rookie Reprint Relics (#/25). Paramount Pairs Relic Cards (up to 15 cards, #/50). Prolific Playmakers Jumbo Relics (up to 20 cards, #/20). Rookie Patch Cards are inserted one per jumbo box and feature a multi-color jersey swatch. In the Name Relics (1/1) feature the nameplate letters from the player's jersey. Good: Topps has done it again, putting together a set builder's dream with 2012 Topps Football. It has a lot of potential great hits. Some nice new inserts also make their debut. The base cards look great, with shots that put the collector in the middle of the action. 2012 Topps Football is a very affordable product with an extensive checklist. Bad: Airbrushed numbers take away from the overall quality of some of the rookies. I would rather see shots of the player at mini-camp or the combine. With only one autograph or memorabilia card per box, it can difficult to pull something big. The Bottom Line: With such a hot rookie class, this is a can’t miss product. Not only are there the popular Rookie Premiere Autographs, Topps has added base rookie autograph variations, and on-card autographs with the 1984 Topps and the 1965 Topps designs. This is also a quarterback collector’s dream with the Quarterback Immortals line of inserts, relics, and autographs. The vibrant colors in the Breast Cancer Awareness and Military-border parallel cards are a great addition to the traditional Gold, Black and Platinum parallels. I love the action shots of the base cards and the clean, clear colors. I also really like some of the set's new additions. I especially like the two new numbered parallels. The pink Breast Cancer Awareness cards add some new color with the sparkling pink border and pink foil stamp. This is one set that I would love to put together. I also like the Military parallels with the grey and black camouflage borders. In the past, I haven't really liked the "vintage design" inserts, but the 1965 “Tall Boy” inserts are very nice with their slim look. Paramount Pairs inserts are neat with their player combinations that are usually associated by team, position, or college. My least favorite insert is Prolific Playmakers. There are simply too many of them and most of the autographed and relic versions of these won't be worth much. 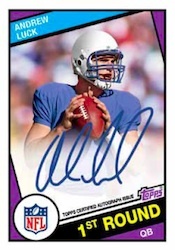 If you are a big collector of legendary quarterbacks like I am, then 2012 Topps Football scores a touchdown with thier QB Immortals line of inserts, autographs, and relics. The relics are difficult to pull, but if you get one, they are a nice innovative card with metal coins, badges, and even film strips highlighting career accomplishments. The checklist is one of the most extensive football products of the year. The base set consists of 440 cards, including 110 rookies. I like this because for many players, especially lineman, this will be one of the only products where they have a card. All the key rookies are here as well. Costing around $55 per box, you can’t beat the quantity of cards pulled. This is a very affordable product for any collector. One downside of the value is that the most common pull from these boxes are the Prolific Playmakers relics that usually sell for around $5. That said, many of the rare hits are doing very well on the secondary market. The possibility of pulling an Andrew Luck or Robert Griffin III autograph makes the chase in 2012 Topps Football fun. I enjoyed opening this product because there are lots of neat inserts, with at least one falling in every pack. To add to the fun, Topps is continuing with their online code cards with the Game Time Giveaway program. These codes yield redemptions for die cut cards or virtual team coins that can be used to predict the outcomes of this season’s games. The only thing I'd like to see improved in the program is more cards and less "virtual stuff". Typical Topps product…fun to bust and hope you hit. Awesome product. Best Topps Football set of the last decade as its packed with rookie cards, cool inserts, and even has its share of big hits. Great Product! It’s interesting to see the pulls on eBay. What will be pulled next? Something I have some knowledge of finally..U get a boatload of cards with this. Did a lot of breaks to. Never really saw any good pulls. But it’s is a really clean, decent looking card set. Something for everybody. Last football card purchase was 1998: 1993 Joe Montana Finest and a pack of 1998 Fleer Ultra. So yesterday I picked up a blaster box of my younger years standby Topps. No big pulls but happy with the design and the easier inserts I did pull. Glad to be back but I think I need some catchin up on the industry! The base cards have a clean, simple, yet attractive design. There are plenty of autographs to chase and even if you don’t get one, there are always the plaque, coin, and medal cards to find too. The tall boys and rookie reprints evoke memories of the past and are a great feature in a modern product. I like the base set and all of the variations of the main set. Although I like the look of the 1965 style insert cards, I don’t like their size. They don’t fit properly with the standard size cards. I’d rather get any other card in the set than one of these half-sized cards. I really liked this years look and design. Nice variety of inserts and I like most of all the paramount pairs and the 1957 blue cards. For me they are a good bang for the two bucks and will continue to buy Topps football cards in the future. Thanks for a good time opening the packs!!! I would totally buy thins cards over any other type of football cards.because they are such a good improvment form last year. The overall card design is way better from 2011. And u get more cards per pack over topps chrome. Also the picture quality is way better. Amazing. This year’s Topps product is fantastic. The base set is aesthetically pleasing, moreso than recent years. The product is PACKED with inserts. Has all the best veterans and rookies. Once again, Topps football is the cornerstone of card collecting. garbage. I have 6 complete sets, not ONE sp variation, autograph, relic, coin, anything!!! I spent a LOT of money trying to get the sp variations, and came up with ABSOUTLY NOTHING!!! Extreemly dissapointed, and will never buy another Topps product EVER again!!!!!!!!! Love Topps flagship products for both baseball & football, I built 2 complete sets of base and about a third of the insert sets, didnt pull any auto’s or relics from retail but I did pull some nice camo’s, pinks, golds and three shortprints, one being “Andrew Luck Scrambling Pose” SP Rookie Card, very stoked on that one, pulled from a lonely pack on sale for $1.29 sitting on some walmart shelf, must of looked at this pack for weeks before I decided to just buy it :) glad I did. Great Product & Great Website for true collectors of the sportscard hobby, thanks.